This treat is a great way to get kids to eat more fruit. Cut the apple into quarters and remove the cores, then cut each one in half to make 16 wedges. Spread ½ teaspoon of nut butter evenly over one side of each wedge. Cut the grapes to give eight thin slices and arrange one in the centre of eight of the wedges, with it sticking just off the edge of the skin side. Stick the sunflower seeds spaced slightly apart upright into the nut butter all along the edges of the skin side, skipping over the grape on those pieces. 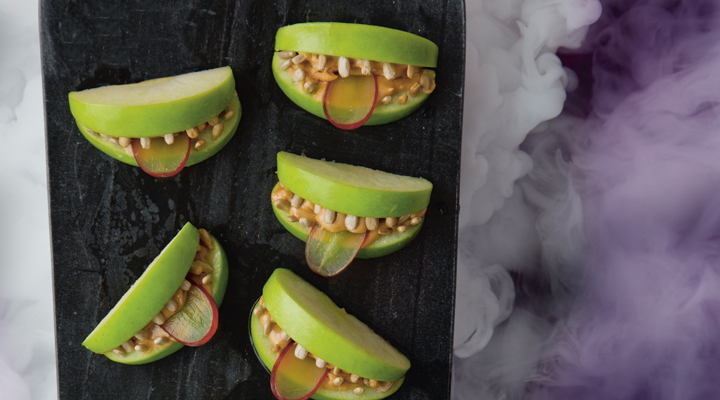 Use the wedges with the grape slices as the bottom, then place the other wedges on top, nut butter side down, to make the monster mouths. Arrange on a plate or board and serve at once.